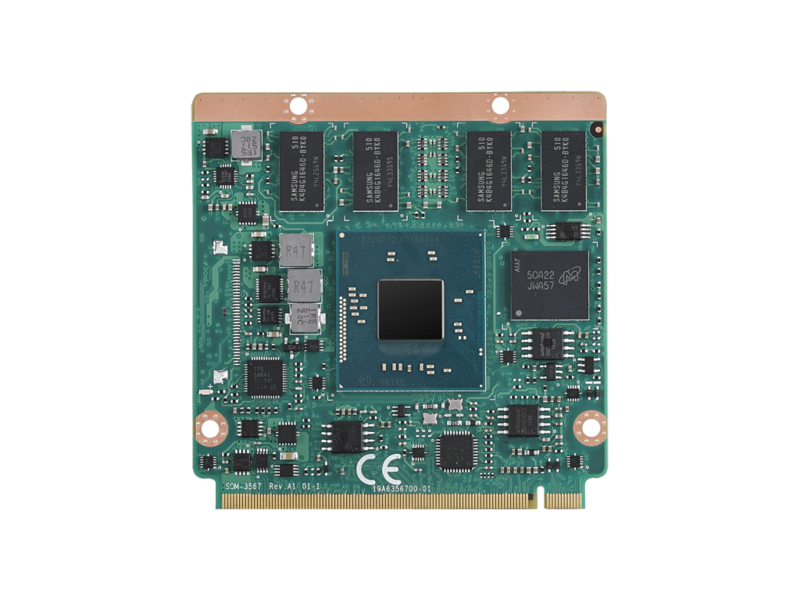 July, 2016, Taipei — Advantech, a leading provider of embedded computing solutions, today announced the release of SOM-3567, a new, low-power, fanless Qseven module, compliant with Qseven revision 2.1 specifications. Powered by an Intel® Atom® E3800 processor with native extended temperature support, SOM-3567 delivers superb graphics and processing performance in a compact (70 x 70 mm) ultra-low profile Qseven form factor. Featuring up to 8 GB of dual-channel DDR3L-1333 memory onboard and optional eMMC support (up to 32 GB), SOM-3567 provides the ideal solution for battery-operated, thin, and compact installations, such as in-vehicle, medical, and industrial mobile computing devices. Channel reservation between eDP and LVDS allows SOM-3567 to support dual displays in an legacy LVDS or advance eDP panels with HDMI/DP interfaces. SOM-3567 also supports 3D APIs which includes DX11, OGL3.2, OCL1.1, and hardware accelerators in H.264/AVC, VC-1, MPEG2, thereby enable high-resolution playback and graphics-intensive applications without substantial CPU load. The SOM-3567 moduleprovides 3 PCIex1 Gen.2 5.0 GT/s by default and option to be 1 PCIe x4 whlie remove GbE supporting, allows a huge bandwidth for data transceiving. It also features GbE, USB 3.0, 6 USB2.0 for for maximum connectivity. Due to the processor is natively support extended temperature, most components and especially key parts are design with extended tempertuare support, to benefit customer applications work under crucial environment more reliable. To fulfill the ever-changing specialized demands for various applications, SOM-3567 is shipped with WISE-Paas/RMM kit in accessory box and an intelligent self-management agent with software control functions and standalone hardware design: iManager on board. It’s a built-in solution chip, a perfect solution that provides a standardized, unified API,integrating several unique platform consolidating functions needed by embedded system integrators to improve consistency, reduce the developers’ efforts and make the product time-to-market. Most importantly, the standalone chip works individually to CPU core logic, that is, it’s an out-of-band control and not influenced by CPU loading providing reliable monitors and controls. Advantech’s SOM-3567 will be available in Q3, 2016. For more information, contact your local Advantech sales representative or visit us online at www.advantech.com.tw/embcore/. Advantech Embedded Core Services offers design-in services and streamlined solutions that broadly integrate embedded boards, peripheral modules, and software. This emphasis on embedded design-in services is aimed at satisfying electronic engineering demands at the design phase to shorten the design and integration phases, thereby minimizing uncertainty and risk. Founded in 1983, Advantech is a leading provider of trusted innovative products, services, and solutions. Advantech offers comprehensive system integration,hardware, software, customer-centric design services, embedded systems, automation products, and global logistics support. We cooperate closely with our partners to provide complete solutions for diverse applications across a wide range of industries. Our mission is to enable an intelligent planet with automation and embedded computing products and solutions that enable smarter working and living. By using Advantech products, the number of potential applications and possible innovations becomes unlimited.